I know that the interior of the APC won't fit into the exterior of the real thing but I have the 1/35 scale kit and when I finally get around to building it I'd like to do it with the doors open showing a reasonalbe fascimile of the interior. Does anyone know if there drawings of how the interior set was arranged? I've watched and watched and it's really hard tog et an idea of how everthing fits together in there. Keeping in mind of course that it really wouldn't fit. It seems to me that the prominent feature of the interior of the APC is the Comand and Control console. This is the console that Gorman sits at and is situated opposite the sliding door, on the drivers side, behind the front left wheel well. Ripley and Burke sit in two seats on the passenger side, forward of the sliding door, but behind the right front wheel. The other marines are seated along both sides. This is contrary to what's stated in the Brincombe book. If I remember right, it states that the Command and Control console is situated along the rear wall of the APC, which makes more sense to me in a practical vehicle. You wouldn't want your commander to be vulnerable to incomming fire or other battlefield hazards that could come in the door as his troops are embarking or disembarking. The drivers area is more difficult to make out. From what I remember, the driver is on the left side of the vehicle, in front of the left front wheel well. His controls seem to be a kind of split lever arrangement with pedals. I don't recal ever seeing a passenger side seat forward of the right front wheel, though it would make sense to me that there could be a seat there for a forward gunner/navigator to run the front gun and assist the driver while the commander manages the platoon and top gun turret from the rear compartment. This is all from memory, so if someone has better info, please chime in and correct me. Afew years back there was an ALIENS magazine published in England and I believe one of those issues had a partial "line" drawing of part of the interior. Would that be of any help? Mind you it's only part of it...and only part of one side. So it's kinda limited in the info it has. I was checking out aliens on d.v.d and they stated that the original weight 72 tons, the production crew stripped 44 tons off then it was hired out to do the final work on wich was completed in two weeks. 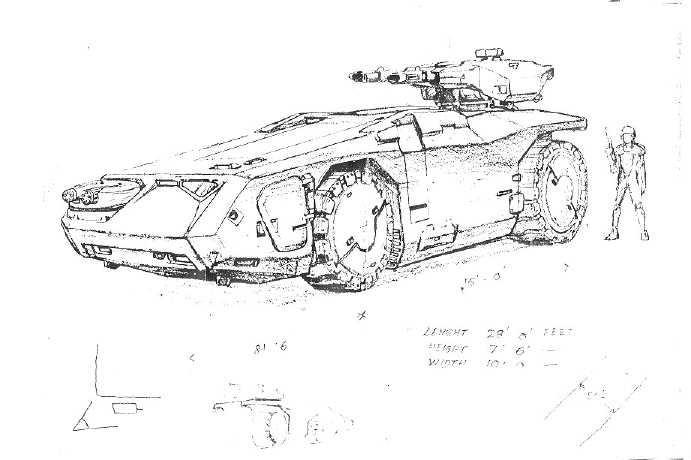 Actually, the exterior shots were done with the practical, heavy, vehicle. The interior shots were done on a set that probably had removable walls or wall sections so that the cameras and lighting would have the kind of access they needed to get the shots. I also seem to remember that when the marines exit the APC right after touchdown, you can see a wall of some kind where Burke and Ripley should be sitting, as well as one just inside the doorway where there should be an empty bay with the comand console behind it. They are also pretty hunched over when they exit, more so than in the interior scenes and you only see a few exit, probably because that was all there was room for in the practical vehicle. It's pretty common practice in the movie industry to use one set or vehicle that can be moved to the location for exterior shots with has little or no internal dressing. They then use a second, differently constructed set for the interior shots that's built on a soundstage so the crew has control over all the elements. 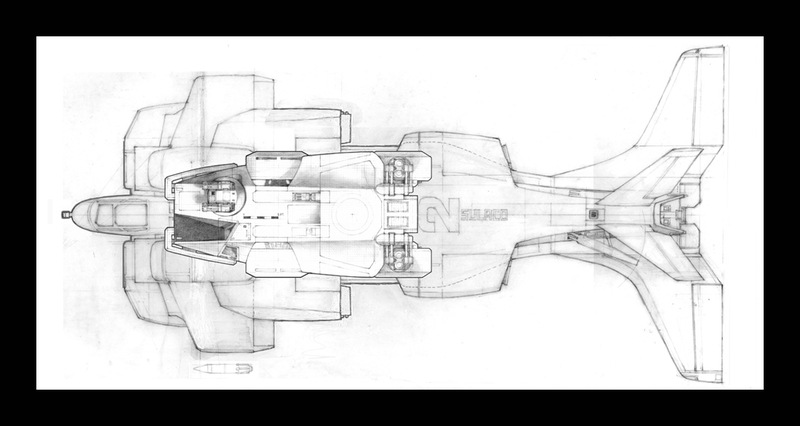 This also allows the insides of vehicles to be bigger than the outsides, the problem we're discussing here. The apc had sliding doors on both sides so that would help with shooting the inside, they also only opened a couple of feet so you still have room for seats next to them, as for the wall you see, if you looked at it from the other door isnt that were the opening for the com bay would be. the d.v.d. states that it had the com built in by an outside company. why go thru all that trouble if your not going to use it. Joe, the practical vehicle was nearly solid, the back 2/3 of it is pretty much all motor due to what it was built on. The thing started life as a 747 tug, and it's got enough motor to move it's 70+ tons of mass along with whatever a loaded 747 weighs. The 44 tons that was removed was mostly ballast, to give it traction when pulling jets around in the rain. The APC interior suffers the "Tardis effect" in that the set is conciderably bigger that the physical size of the APC allows for. A good clue to this is the lack of wheel wells on the inside, all 4 of those huge wheels are steerable and the wheel wells should eat up a bunch of space inside. Yet they don't show at all on the interior set, which as someone else pointed out needs removable walls to be able to light it and have room to set up the cameras. 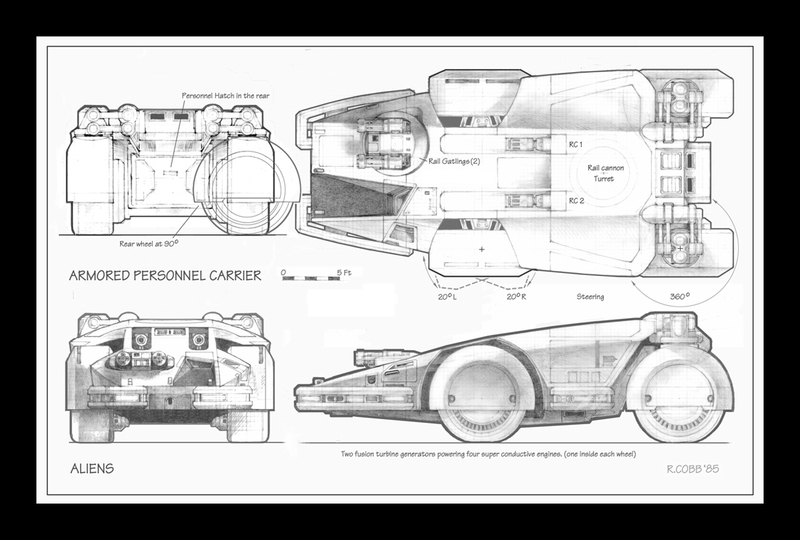 I'd imagine whoever did the continuity between scenes whold be pleased that you believe the interior fits, but if you try to draw it to scale, you'll find out that it can't possibly do so. 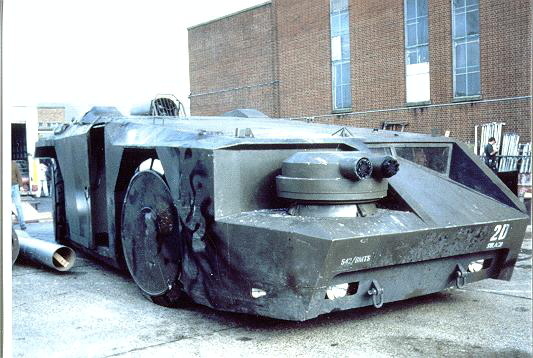 The full size APC was outside the Odeon in Leicester square for the premier of Aliens, not for Alien War. I just thought I would drop you a line and let you know that I have some plans of the APC interior, I don't know how accurate they are but it is what I me and my friend used when we built the giant APC, that's us on the picture Harry has posted. I will scan them and try and work out how to post a small JPEG on this EZboard, so hang on a bit and I'll be back. and a couple random Aliens sites through Google. 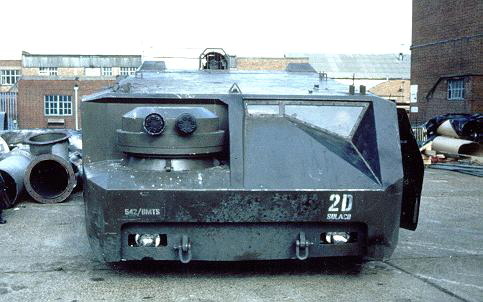 Photos of the ATT77 Hunslet Tractor, believed to be the base vehicle used to make the APC.